Power drawn from renewable energy is expected to soar in the future, although the country’s capacity to integrate this source of energy into the national power grid is still limited, possibly causing throttling on the network, heard attendants at a seminar recently held in Hanoi. The seminar, entitled ‘Renewable Energy Integration: Challenges and Technology,’ co-organized by the Ministry of Industry and Trade (MOIT) and ABB Vietnam, aimed to explore the challenges in achieving Vietnam’s ambition to increase the generation and consumption of renewable energy, and how technology can help resolve them. 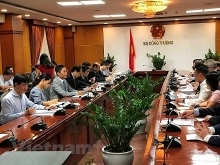 Nguyen Van Thành, deputy director of the Electric and Renewable Energy Department under the Ministry of Industry and Trade, said Việt Nam has seen rapid development of power plants which posed great challenges to transmission networks. 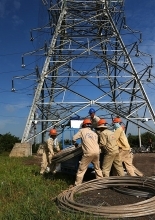 According to Vietnam’s Power Development Master Plan for the 2016-20 period (PDP VII), the demand for electricity consumption in Vietnam will increase by about 10-11 per cent annually, which exceeds the annual GDP growth rate. As one of the fastest growing economies in the region, Việt Nam is experiencing rapid industrialisation. In parallel with the industrialisation process, people tend to move to cities and vast urbanization is taking place. To support socio-economic development sustainably, the country is encouraging renewable energy development to reduce the dependence on fossil fuel based energy. Under the plan, the total designed capacity of solar power generation must amount to 850MW in 2020 and 4,000MW by 2025. Meanwhile, the total capacity of solar and wind power set for 2030 are 12,000MW and 6,000MW, respectively. “However, fossil fuel accounted for more than half the country’s power in 2017 according to an annual report by Electricity of Vietnam (EVN),” he said. 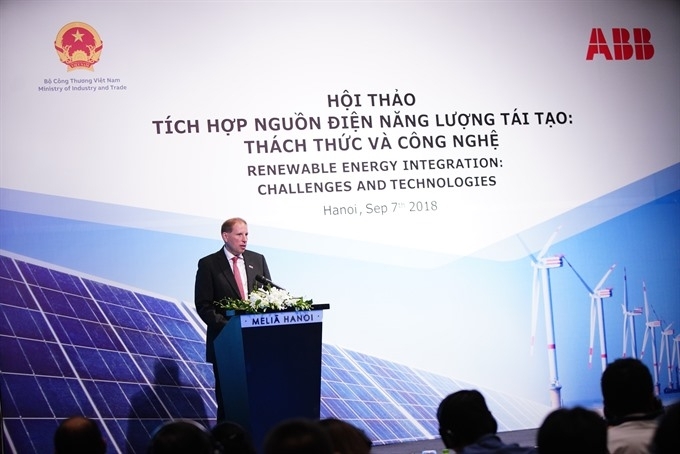 The PDP VII outlines active steps that Vietnam is taking to develop renewable energy resources in order to meet the country’s electricity demand, in which renewable energy will account for 10 percent of the country’s power generation by 2030 (12 GW). The plan also outlines the need to invest in a power transmission grid with flexible operation and high automation capabilities from electricity transmission to distribution; as well as developing unmanned substations and substations. In addition, it highlights the need to accelerate electrification in rural and mountainous areas to ensure access to electricity of households by 2020. Sharing the opinions, Nguyen Minh Quang from Power System Analysis and Planning under the EVN’s National Load Dispatch Center, said Vietnam produces more than 170 billion kWh from fossil fuel based energies such as coal and gas. “Vietnam has had to import coal for power generation since 2017. The investment for thermal power plants faces difficulties due to capital shortage as banks have not encouraged lending to coal-fired electricity plants but renewable energies,” Quang said. However, power grid conditions are not prepared to adopt this kind of energy. It takes three years, on average, to build a power grid project, while a solar power project needs only one year to be put in place. As a result, electric grid development cannot catch up with the proliferation of solar and wind power projects. Brian Hull, general director of ABB Vietnam, noted that Vietnam should apply advanced technology to cope with challenges in its power system. Simultaneously, the country should upgrade electric load and controlling systems, to ensure it can promptly tackle potential incidents. Venu Nuguri, Group Senior Vice President for ABB’s Power Grids Division in South Asia, Middle East and Africa, said as the country moves towards clean energy, the power grid will need to adapt to the influx of renewable energy, which is intermittent and also characterised by distributed generation. “Not only does this call for wider industry collaboration and policy discussions, it is also important to make the right technology choices. Technology will enable the grid to be flexible and adapt to the new realities of distributed generation and multi-directional power flow. Digitalisation is key to create the power grid of the future,” he added.